–Over 12,000 lb. shipping weight!! For the fifth year in a row, Keystone Wood Specialties has collected donations of non-parishable snacks, personal care items, and other fun things to create goodie bags for US troops stationed overseas. And every year we are surprised with the response. Keystone employees, local and non-local companies, and area elementary and high schools have joined in to provide enough treats to fill 7,086 one-gallon plastic bags with holiday cheer. Each bag also contained a greeting from Keystone Wood Specialties and a Christmas card or two created by area school students from five school districts across Lancaster County, Pennsylvania. 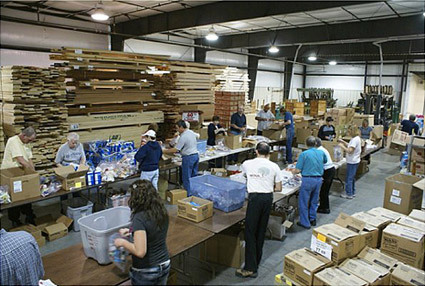 Fittingly, each year, Keystone employees volunteer to work on Wednesday and Thursday evenings of Veteran’s Day week in November to pack the donated goods into the one-gallon bags and prepare them for shipping. The response was so great this year that we had to add Friday, as well. When all the packing was done this year, thirteen skids of treats were shipped to Florida to be forwarded on to destinations in Afhanistan, Iraq, Turkey and other deployments around the world. On Christmas Eve, military chaplains distribute the bags to troops in their care. We are so very grateful to everyone who joined us to make Operation Keystone Cares 2011 a success. 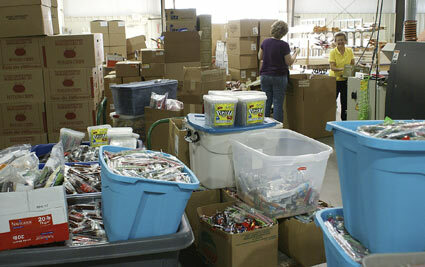 volunteer to fill goodie bags for US troops at Christmas. Keystone employees and volunteers packing more than 7,000 goodie bags. 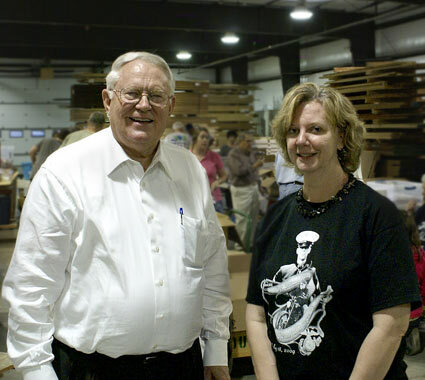 US Congressman Joe Pitts (left) poses with project coordinator Sandi Zook. He was on hand again this year, as he has each year since 2008, to help fill bags and lend a word of encouragement. He reminded us how important and how appreciated our effort is. A small taste of home at Christmas means a lot to the men and women who give so much for the cause of freedom. Donations for the troops arrived from Keystone employees, local friends, area school children, and from companies across several states. Sixty-nine volunteers joined in to pack goodie bags. Local elementary and high school students hand made 10,000 greeting cards. Thirteen skids of goodies! 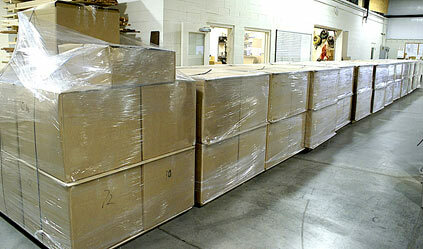 Each skid has 8 cartons filled with 72 goodie bags. 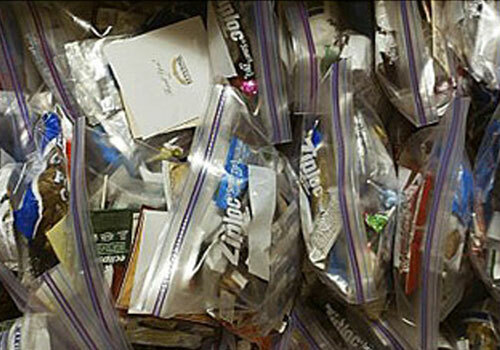 The final skid included a mixturre of goodie bags and bulk items that could not be bagged.